A special General Conference of The United Methodist Church will take place Feb 23-26 in St. Louis, to set policy around issues concerning the participation of LGBTQ individuals. As a Reconciling Congregation, our hope is that the UMC will modify its policies to allow for the full participation of ALL people, in EVERY aspect of church life. Immediately following General Conference there will likely be many questions and a waiting period to see how things get hammered out, no matter which plan is passed (or if no plan passes!). 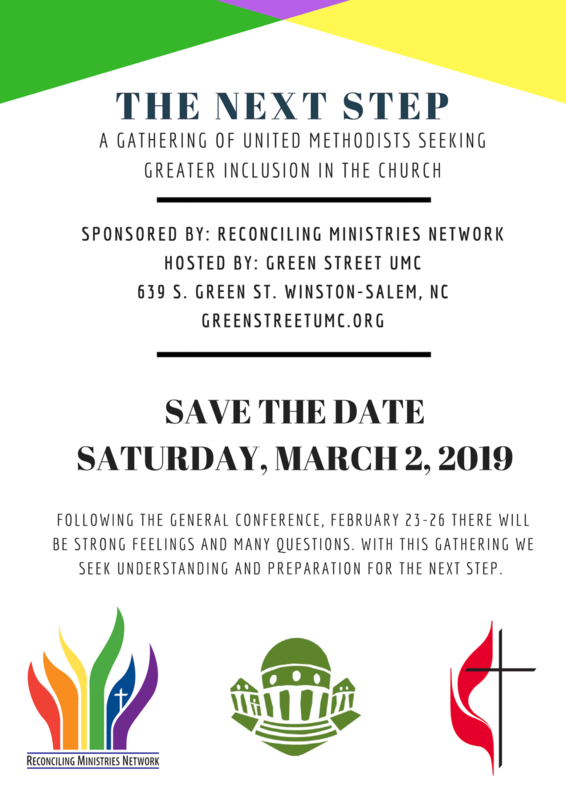 Our Friends at Green Street UMC in Winston-Salem are making plans to host a worship service with time for follow-up discussion and planning on Saturday March 2nd. See attached flyer for details.